Below you can view all the homes for sale in the Candle Creek subdivision located in Henderson Nevada. 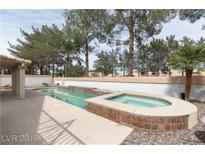 Listings in Candle Creek are updated daily from data we receive from the Las Vegas multiple listing service. To learn more about any of these homes or to receive custom notifications when a new property is listed for sale in Candle Creek, give us a call at 702-323-5903. Low-E windows, blinds, and ceiling fans ,2 Fireplaces,Large private backyard w covered patio, BBQ area, Separate side yard w Putting Golf Area,Garage w/ epoxy & storage~Bring your toothbrush move in Today !! ! MLS#2087947. Realty ONE Group, Inc. Located on a quiet cul-de-sac in desirable Henderson, this gorgeous home features wood laminate flooring, wet bar in family room, tile backsplash, double ovens, central vac, downstairs bedroom & bath, large master bedroom suite w/ two-way fireplace, tile surround on master bath & shower, large walk-in closet, good size yard w/ new above-ground spa w/ LED lights, built-in BBQ & two car garage w/ epoxy flooring. Barely lived in & move-in ready! MLS#2087352. Windermere Prestige Properties. Close to shopping, freeway access, restaurants & recreation. MLS#2087724. Signature Real Estate Group. Green Valley location near Galleria mall, restaurants & schools. MLS#2086373. GK Properties. Seller needs possession until June 14. MLS#2080219. Desert Sun Realty. Too much to list! Must See! MLS#2078800. Platinum R.E. Professionals. Move in ready, come and see it today! MLS#2078170. Marshall Stearns Real Estate. LARGE covered patio & NO rear neighbor! MUST SEE! MLS#2075687. Monopoly Realty & Mgmt Inc.
AC unit on roof replaced in 2014. MLS#2073278. Realty ONE Group, Inc.
Near hwys, shopping, sports parks, dining & schools! Price Adjusted-Will sell fast! MLS#2065523. Coldwell Banker Premier. Magnificent Henderson House..Open Floorplan....Bright Spacious Chef-style Kitchen With Stainless Steel Appliances.......Vaulting Ceilings In Living Room With Modern Design Fireplace.....Separate Dining Room..Huge Family Room With Custom Design Fireplace...Crystal Lights All Over The House....Big Loft On A Second Floor Can Be Used As Entertainment Room...Backyard With Build-in-barbecue...Close To The Park, Church, Recreation Center, Indoor Pool MLS#2070322. Croteau Real Estate Services.